As some of my local friends know, I retired my 2001 May-Craft 18-footer at the end of last season, selling the boat to a father and son-in-law in Lavallette who plan on keeping the fish coming over her rails. The replacement boat is a 2017 Tidewater 210 (sold by Coastal Boat Sales in Brick, one of our Shorebeat sponsors). While I love the new boat from bow to stern, May was probably the worst month to be a new boat owner. Westerly winds whipped up the bay on an almost-daily basis when it was sunny, and every other day was cloudy and dreary. Those dreary days came to an end on my first fluke trip of the season along with my father, Gary, when the as-yet-unnamed Tidewater proved she’s worth her monthly boat payments. While fishing the Manasquan River along the channel of Clark’s Landing, the first fish to ever hit the deck was a tiny flounder. “Just a baby. We’re looking for Moby Fluke,” my dad said, using one of his favorite fishing phrases. It was only five minutes later that the boat’s second drift yielded its first keeper – of the season, and of the new boat. Catching a keeper flounder is always fun, but being out on the water for the first time of the season and christening the new boat with my dad made it extra special. It was also a good decision to stay inside the bay and river. According to most fishing reports this week, fluke have been hard to come by in the ocean, especially in the surf, but the usual spots in the back have been loaded with them. The Manasquan River continues to be the hot spot, along with the BI/BB buoys to our south. The biggest fish are being caught on Berkeley Gulp baits. For those who are really looking to fool the fish this weekend, a tidbit from Grumpy’s Tackle in Seaside Park might go a long way. Sandeels have apparently arrived, meaning that mimicking the popular bait fish with artificial lures and soft plastics will be the ticket. For those hunting striped bass in the suds (or from a boat), Ava jigs with colored “tails” get the job done best. “Bit odd to be talking Sandeels in June but we′ll take it,” Grumpy said in his report. Plugs and poppers are also producing fish, and there are still bluefish remaining in the bay. I anchored up near one of the concrete bases of the Route 37 bridge Thursday night for about an hour and a half (from around 7 p.m. to 8:30p.m.) and threw poppers and shiny metals to see if I could find a bluefish or two. One fish bit and was lost on the way in, but another ferociously attacked the Hopkins lure and was released after being boated. It’s about that time of year when the bluefish will begin traveling north, making the northern mouth of the Point Pleasant Canal one of the best places to find them during the evening hours. Poppers are always my go-to for this fun activity. 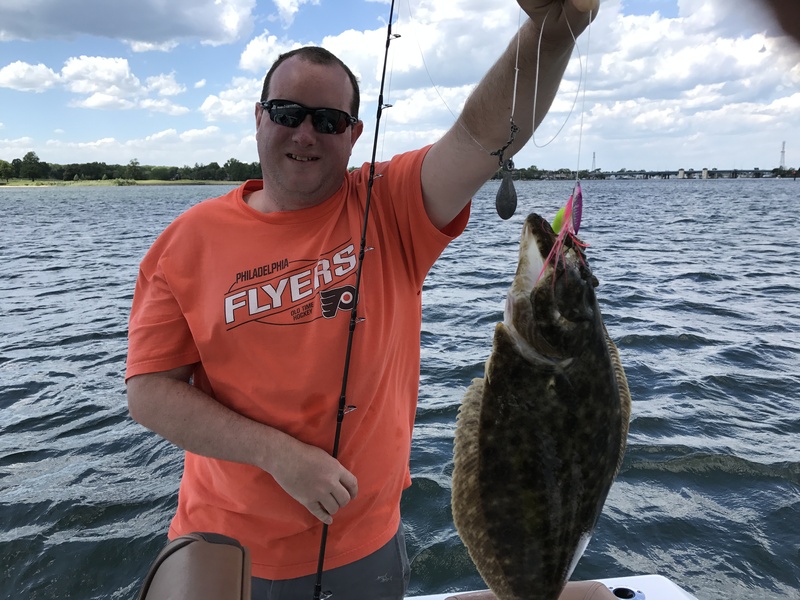 Off the beaches, bass and blues were mostly hooked in the morning and evening hours, said Mario from Murphy’s Hook House in Toms River. There have also been a few bass hooked in the suds in Normandy Beach this week, though participation has been low given the weather. On the party boats, a strong current made for a fast drift most of the week, and a storm offshore will doubtlessly make things choppy Friday (and potentially Saturday). A slow pick of fluke came over the rails of most of the boats, but the Dauntless ran into some excellent sea bassing, Capt. Butch told FishingReportsNow.com. “Lots of small bites, but by the end of trips, almost all customers limited out,” the captain told the website. This week, you got to see my fish, but next week we’d like to see yours with this column! Send your reports and photos to daniel@shorebeat.com and we’ll be sure to feature them here.